aloe vera is well known plant in today's world. It has lot of benefits in healthcare section and beauty section too. 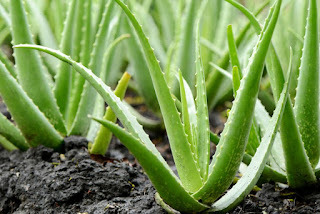 Now-a-days aloe vera is a common ingredients of many of cosmetics like Kajal, face cream etc. There has no end to discussion about aloe's benefits. Aloe vera is a superplant! You can use aloe in various purpose. Aloe vera is a succulent tropical plant. It comes from 'cactus' group. Normally we use the fleshy part from leaves of this plant. Aloe leaves made up with three layers, and plant contains all the beneficial gel into the inner most part of it's leaves. It is completely safe to consume raw aloe vera. You can also eat the pale green skin of stalks of Aloe Vera, but it is quite bitter in taste. So it is good to peel all the skin of aloe vera stalks and eat only the fleshy meat inside the stalk. ● first cut a stalk of aloe vera from the plant. ● wash the aloe vera stalk with regular water. ● put the lean a non-metal pot. (uses of glass utensils are best for that). ● keep it stand vertically for at least half an hour. ● after ½ an hour to 4 minutes just take out aloe stem from the glass pot. now you can see a pale yellow colored liquid keep left into the pot. Do you know what is this? This is the poison of aloe vera. ● Now it is all safe to eat. ● Peel all the green skin of that stem by using a sharp knife. At last you got all the fleshy meat of raw aloe with the gel intact. ● Take another glass pot, and scoop out all fleshy meat or cut into small pieces, and put all of them into the second pot. ● pour ¼ teaspoon of fresh lemon juice into the aloe vera for storing it into the refrigerator for 5-6 days. ● But it best to consume fresh rather than the frozen one. ● Less uses of metal is keep it fresh and natural. Take quarter glass of water (non-metallic). Take 2 tablespoon of aloe (with gel) into the glass. Pour some honey (1 teaspoon). Mix them all togeother and sip the liquid immediately. After taken of 7 days you can easily rectify the difference between before and after taking of aloe gel. Always drink aloe vera gel and flesh in an empty stomach. And keep your stomach empty at least for a hour, before and after the taking of aloe for best result. ● You can also make jam or pickle of aloe. ● Use aloe flesh or aloe meat into your salad, by cutting it in small pieces. ● People can also boil aloe in sugar with some lime juice. ● You can use aloe in soups or stew too. ● You can also add aloe cubes into your fruit salad. ● Aloe can be cooked with some green vegetables. Aloe Vera has lot of health benefits. It has lot of nutritious value. It is also a healing plant along with superplant. It is proven that aloe can help to heal several types of diseases of human being. Nutrious Value - Aloe Vera has lot antioxidants and anti-healing properties. It has lot of vitamins, and minerals, like - Vitamin C, A, B12, Amino acids, Calcium, Protein, Magnesium. Everyone (mostly) can use aloe vera for their skin treatment. Anyone can apply aloe gel, outer part of their overall skin, face, hair etc. In this matter, you can use both the fresh aloe vera gel or you can get aloe gel tube from market too. If your desire to take fresh aloe then follow the instruction I've already written the whole process ago. Pimple, Oily skin, Acne those are very common problem most if us. People who are suffering with all these skin problem get relax now. You can safely use aloe on your skin anywhere. There are lot of aloe vera gel brand in the whole world. You can buy it as per your choice. ● Take small amount of gel onto your palm. Apply it on your whole face, massage thoroughly for 2-3 minutes, keep it overnight. Wash it off on the next day morning with some lukewarm water. Pat dry your face. ● Apply a layer of aloe gel onto your skin/ face before 30 minutes of bathe, then wash it off. ● Can use it as your make up spray. Take a bottle, pour some aloe vera gel with some water, shake it very well, spray it as make up spray. ● For Facial purpose, you can use aloe vera gel rather than the Facial Massage Cream. ●Consume fresh Aloe Vera Meat and Gel with some Honey for better result. ●Apply Aloe Vera scalp over your hair with scalp, massage gently, leave for 15-20 minutes, wash carefully. ●Aloe Vera can be used as hair spray for frizz free hair. There are lost of face or hair pack with the using of aloe vera. I'll share all those in another blog. ●Everyone can be use aloevera gel instead their eye cream. ●To make your eye tireless for excessive uses of mobile, tv, laptop, apply aloe gel all over your eye area, it soothes fast. Aloe vera can be used as soothing gel for small cuts or the case of burn. There are several uses of Aloe Vera and one blog is not enough to explain about this Superplant! Aloe Vera is completely a medicinal plant and to uses of aloe is completely safe. Just keep few steps always keep in your mind for uses of fresh Aloe Vera. Because poison of this plant can harm you. So it is better to drop it's all poison first then use the meat and gel of it.